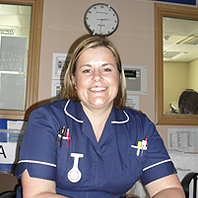 Louise Herrington studied Access to Nursing at Derby College as the first step in achieving her goal of a career change. She went on to qualify in nursing at the University of Nottingham and is now Sister in charge of an elderly rehabilitation ward at Derby’s London Road Community Hospital. Find out about studying Access to Nursing at Derby College.